Very nice. I love the details. Agreed. But I'm curious - is the head based on some contemporary artwork? Or is it the artist's conception? Yes Michael as far as I am aware it was based on this one found here http://www.ordo-militiae-templi.org/la- ... -P-25.html but based on other paintings of him that are similar. 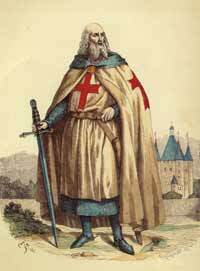 The model clearly indicates that de Molay is wearing a calf-length mail hauberk and some sort of mail round his shoulders, perhaps intended to represent a coif or aventail. A calf-length hauberk would be extremely heavy and restrict movement on foot. It would be quite out of the question to mount a horse in such a garment, much less to sit astride (even to sit side-saddle - a ridiculous concept for a knight - would be impractical, women who did so wore long skirts with wide hems that they often needed to hoist up with a wrist loop when walking). Mail head-coverings usually covered the fore-head and lower jaw and therefore had a hole for eyes, nose and mouth that would have been too small to allow the garment to be pushed back over the shoulders; it would have to be on or off. 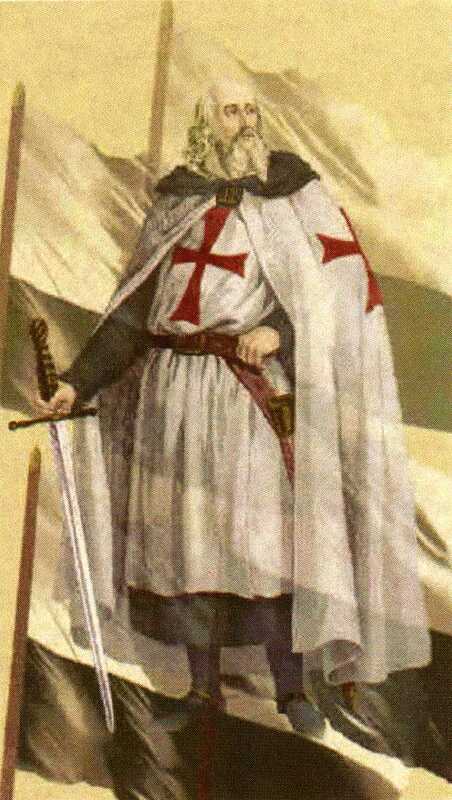 The picture of de Molay clearly shows a dark cloth garment, possibly a monk's habit, over which is the white surcoat and cloak. This romantic image of a knight is not intended to show him kitted out for battle. Thanks. But was the painting actually contemporary with De Molay, or maybe based on a contemporary description? Michael F. McCartney wrote: Thanks. But was the painting actually contemporary with De Molay, or maybe based on a contemporary description? To me the style of the painting suggested 19th century romantic. A quick Wiki search revealed that original was indeed a nineteenth-century colour lithograph by a French artist named Chevauchet. The lithograph in question was one of a series depicting Parisian costume through the ages. I have - as yet - found no information on this artist, except that he was a "refusé" at the Paris Salon in 1835 and 1836. This Chevauchet should not be confused with a 20th century artist by the same name whose style is quite different. Given that the statuette is modelled on an image painted by an artist who lived more than 600 years after de Molay's death, I think we can be pretty sure that any likeness, either facial or dress, is at best fanciful. The 19th century romantic revival of interest in things medieval (think Sir Walter Scott's "Ivanhoe") led to a flourishing industry in "authentic" images and stories relating to famous people from the middle ages about whom very little was known. As far as I can discover the only remotely contemporary images of de Molay depict his death by burning and were painted nearly a century after the event. Thanks! Makes sense. Hopefully the garb is reasonably authentically period. Michael F. McCartney wrote: Thanks! Makes sense. Hopefully the garb is reasonably authentically period.